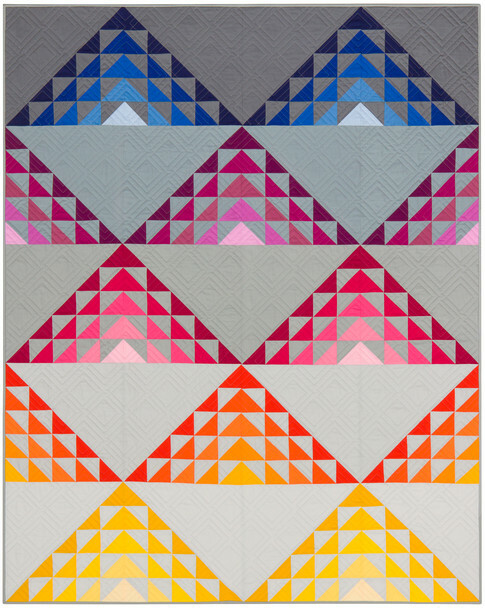 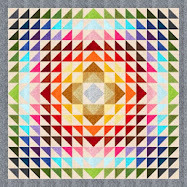 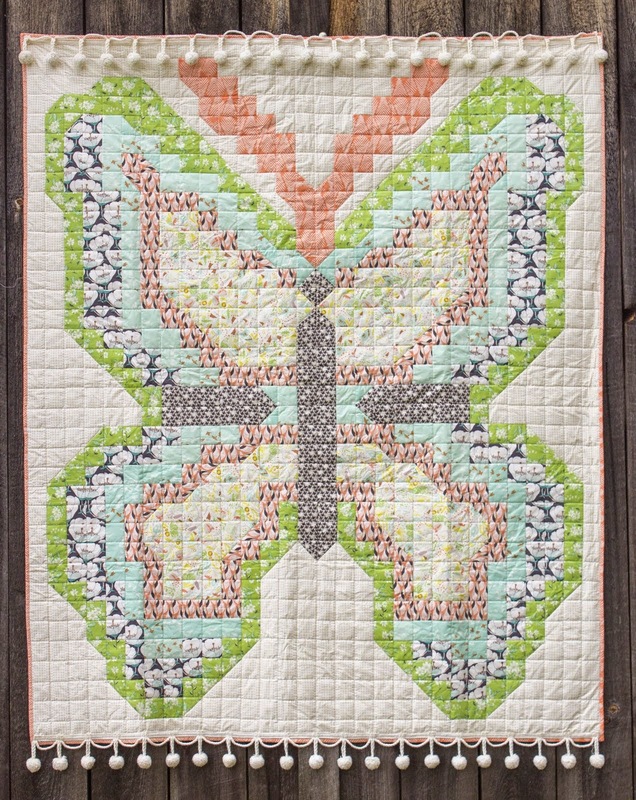 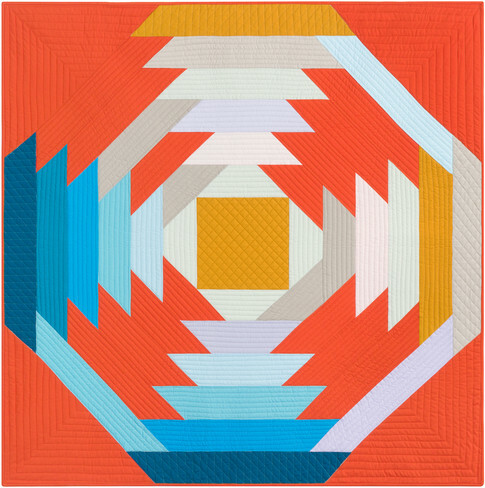 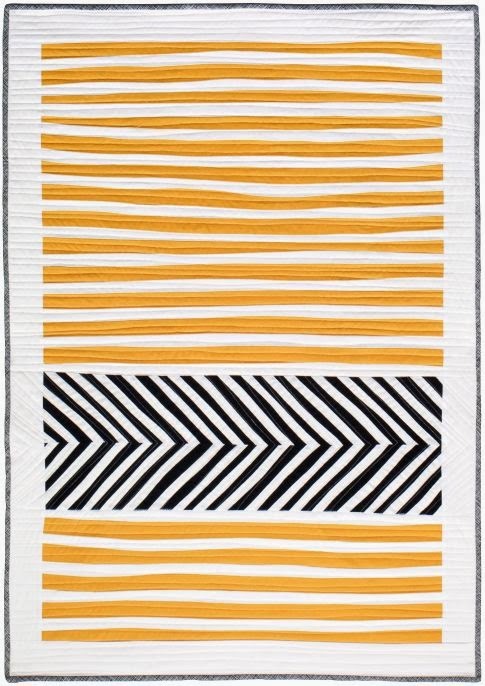 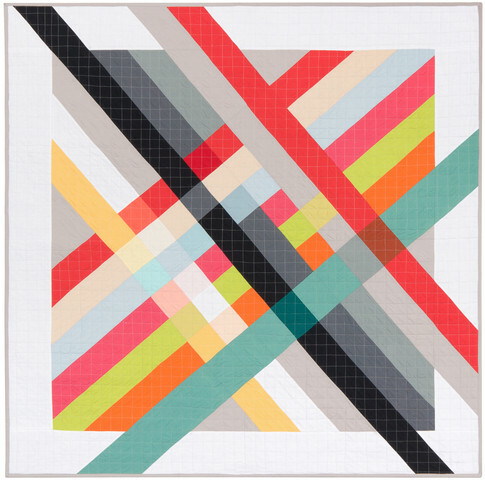 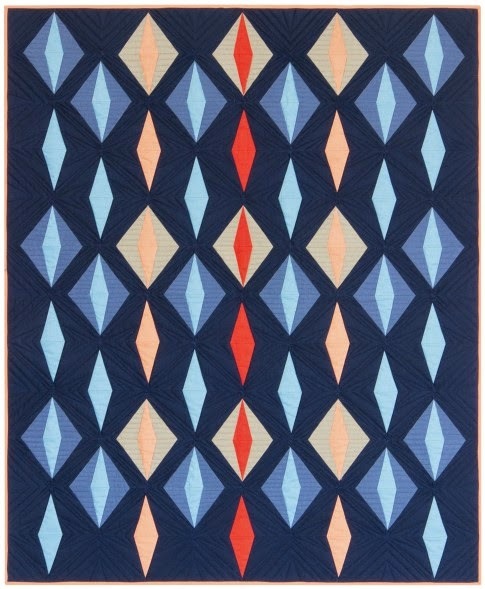 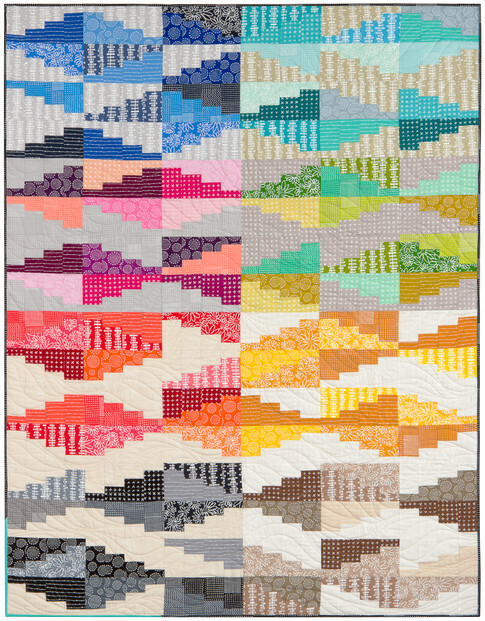 For our catch-up quilt show, we saved some contemporary quilts to show you today. 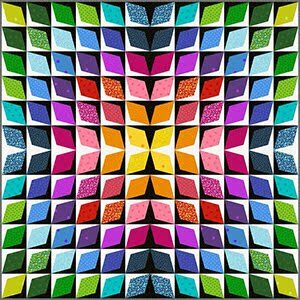 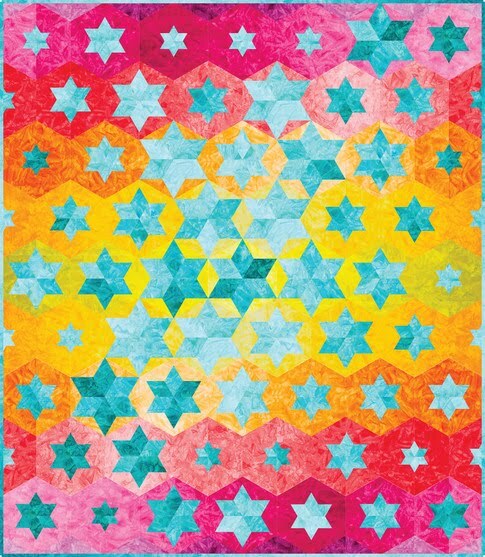 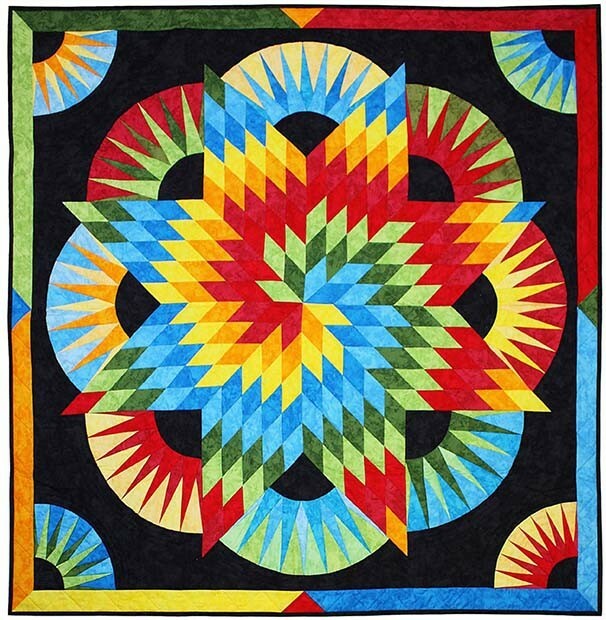 These quilts really captured our attention with their interesting illusions, bright colors, and bold designs. 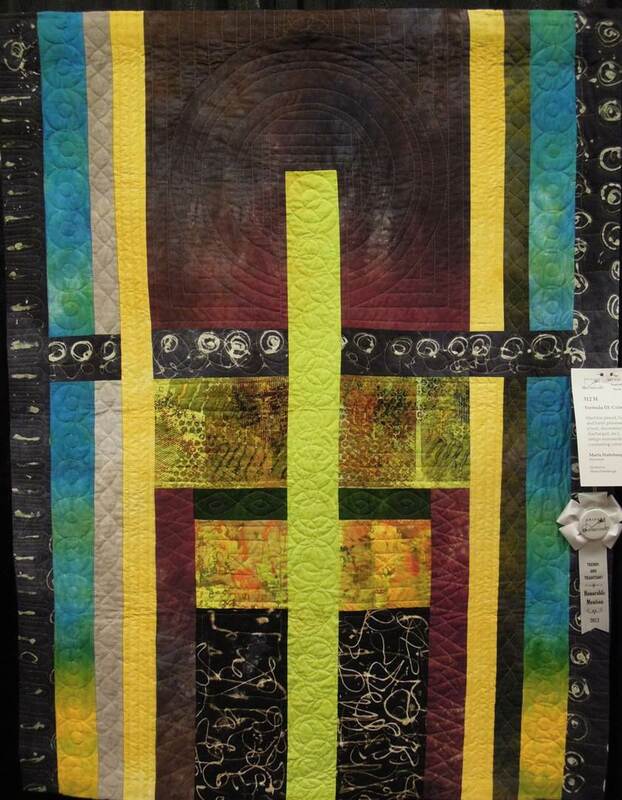 This contemporary quilt of illusion was juried into the Art Quilts XVII - Integrating A Paradox (November 2012 - January 2013) and won 2nd prize - Art/Abstract at the 2013 Arizona Quilters Guild show. 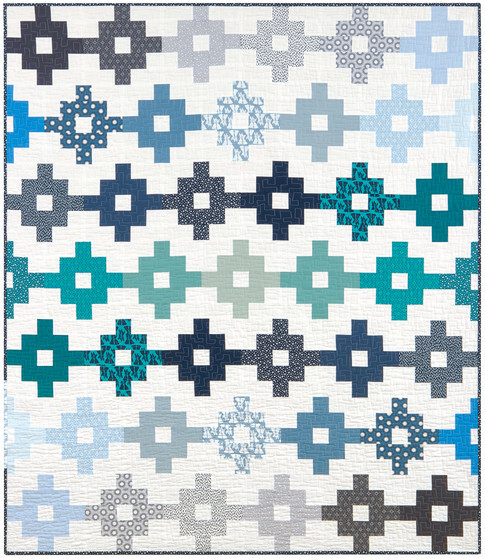 We love the surreal quality of the sky which is just visible beyond the 'window'. 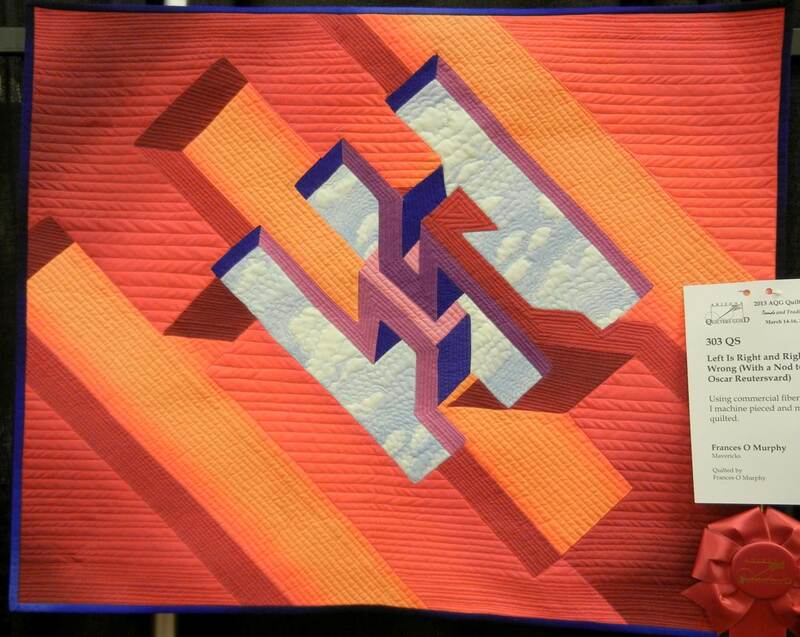 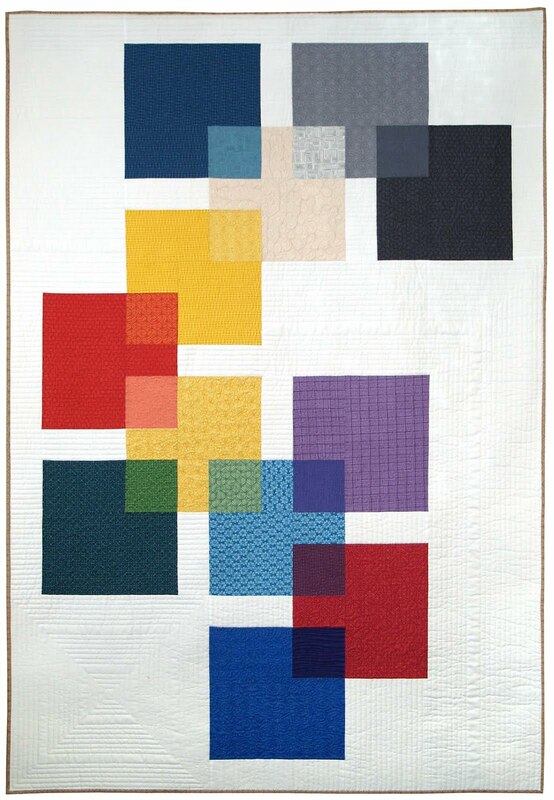 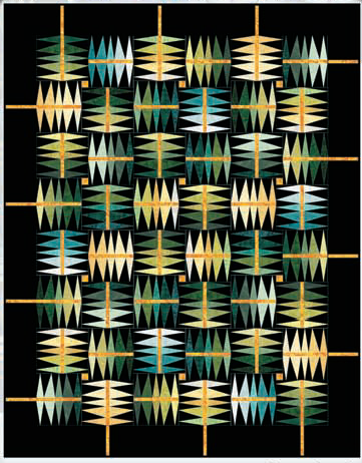 Frances O. Murphy designed this quilt "with a nod to Oscar Reutersvärd" (1915–2002). 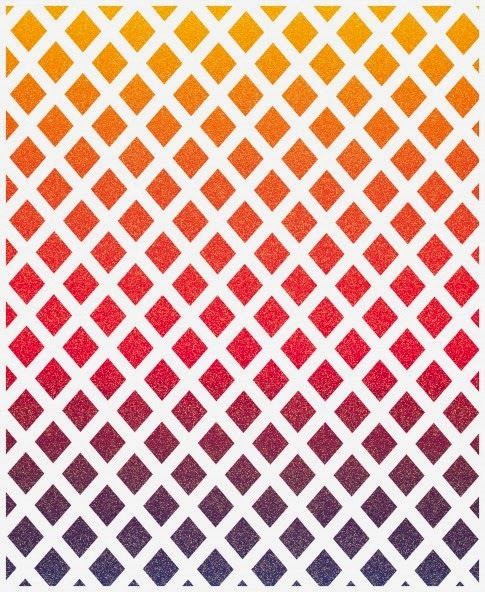 Reutersvärd was a Swedish graphic artist who pioneered the art of 3D drawings which may initially appear feasible, yet cannot be physically constructed; see Reutersvärd's Window in the Floor illusion. 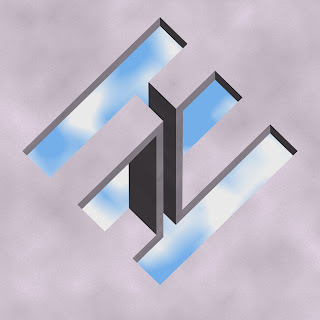 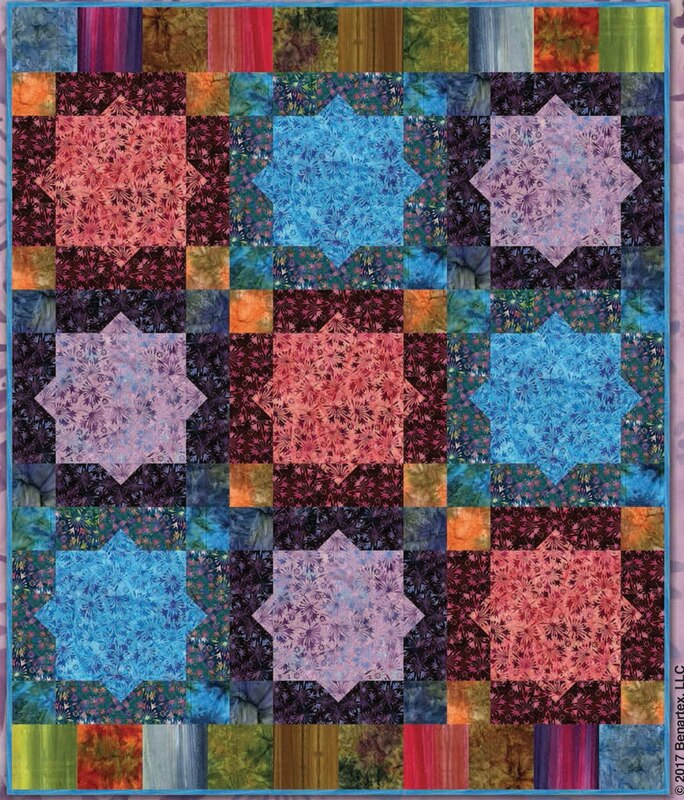 An example of an Impossible Window, rendered by Catherine Leah Palmer, is shown below. 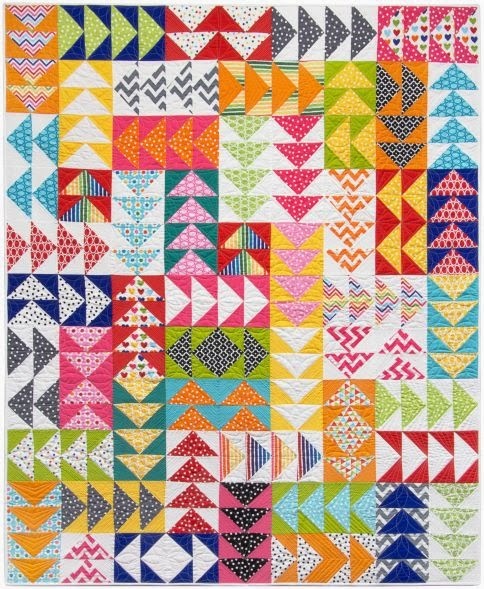 We loved this whimsical mini quilt by Jan Aranoff, who says: “ Recently I began creating art quilts based on Alexander Calder’s artistic style. 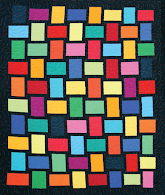 This art quilt adapts his [red, blue and yellow] color palette while incorporating a variety of quilting techniques." 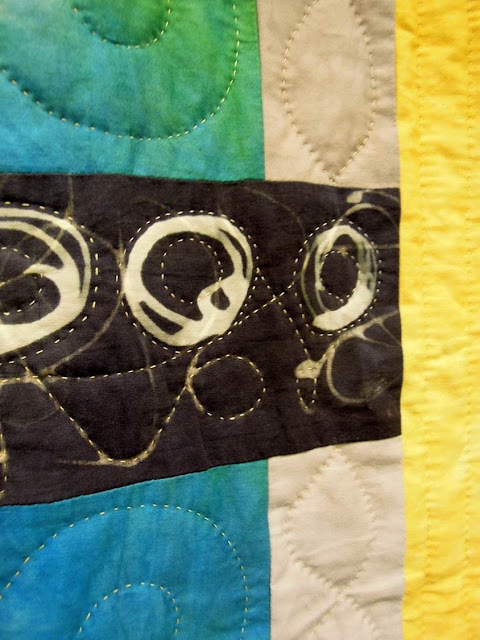 Jan's quilt, with its raw-edge appliqued circles, brings to mind Calder's circles and spirals. 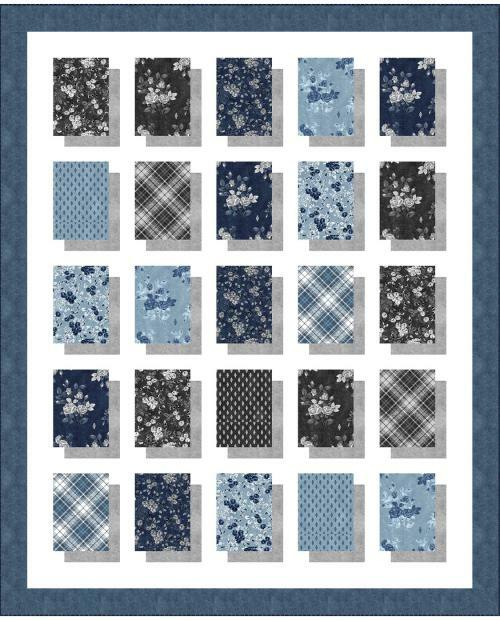 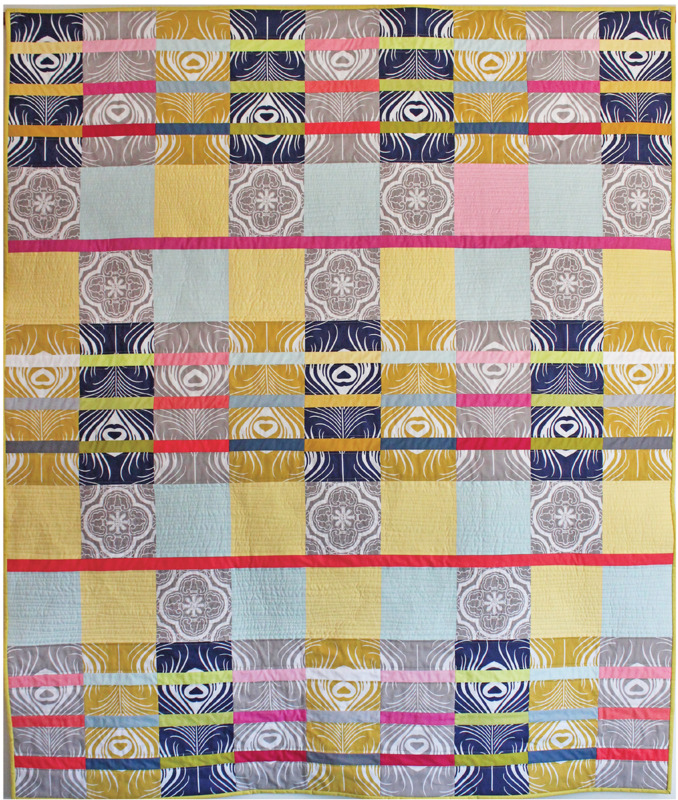 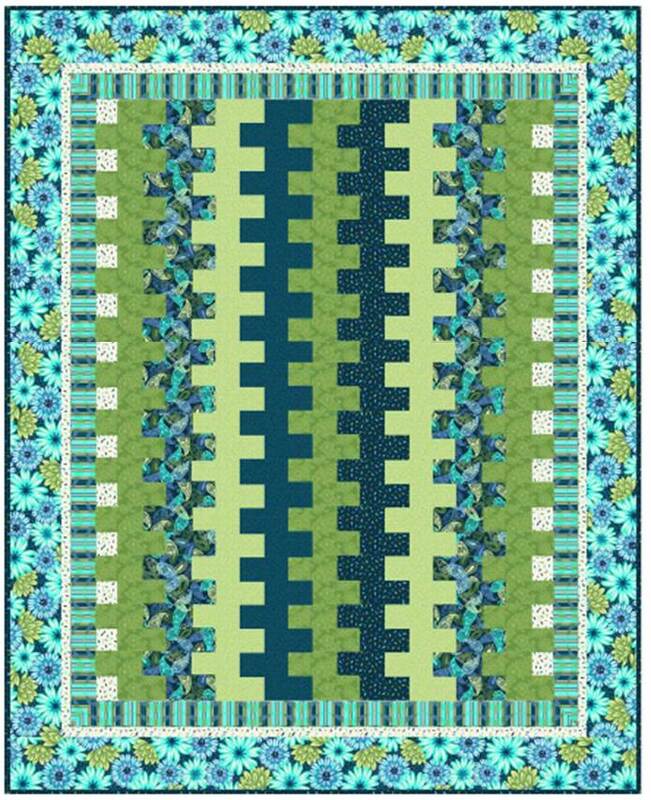 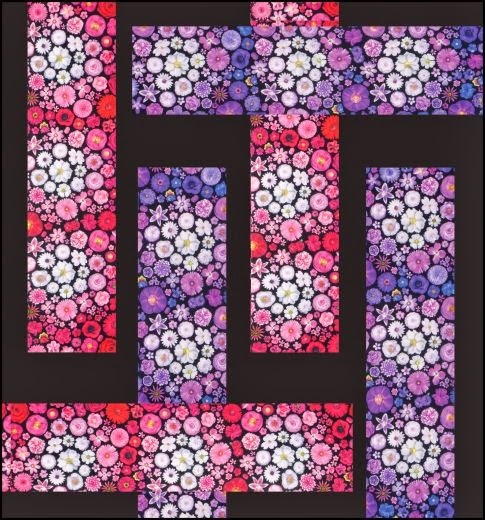 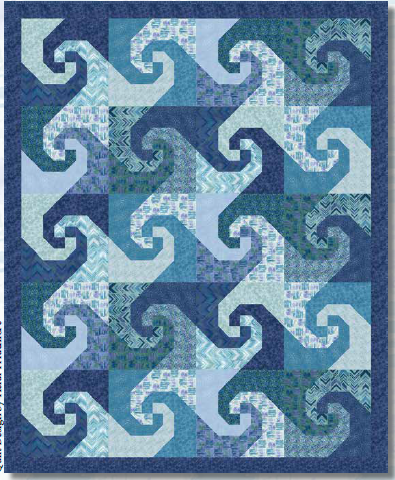 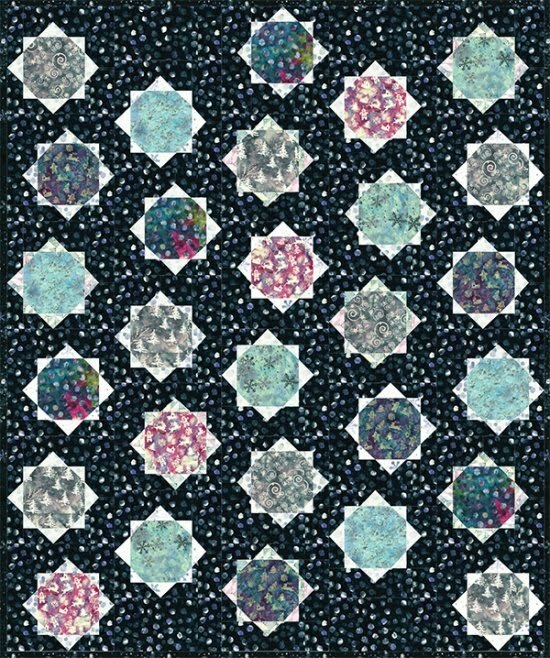 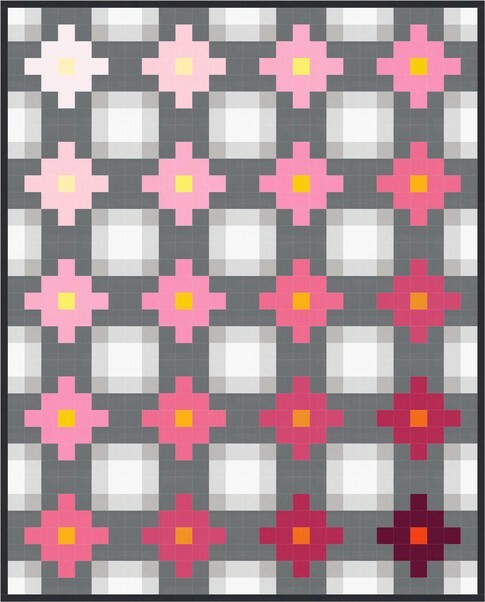 Here is a selvage quilt that really sparkles, thanks to the use of bright solids in every "flower" block. 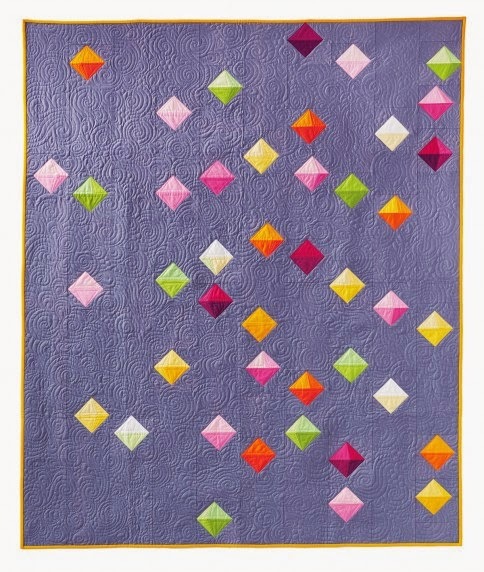 Beverly Hawkins says: "I used all of the selvedges I had in my fabric stash, then I started asking my family and friends for all of their selvedges"! 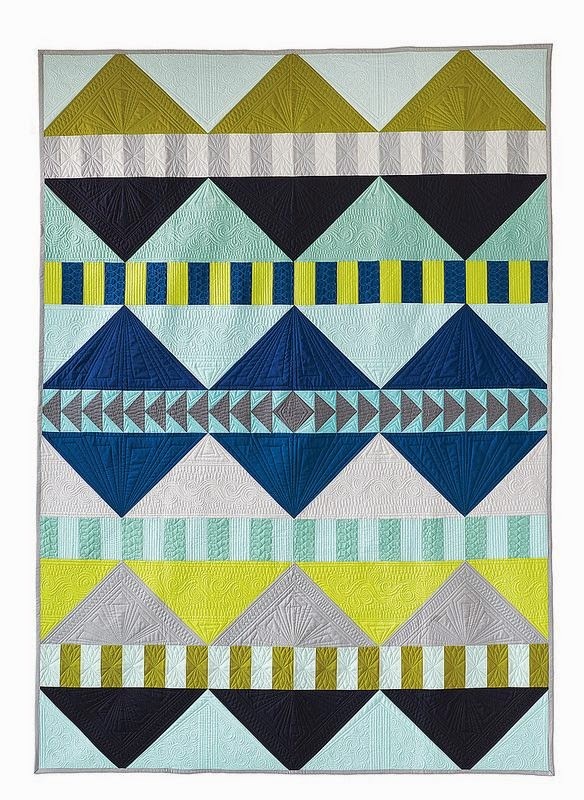 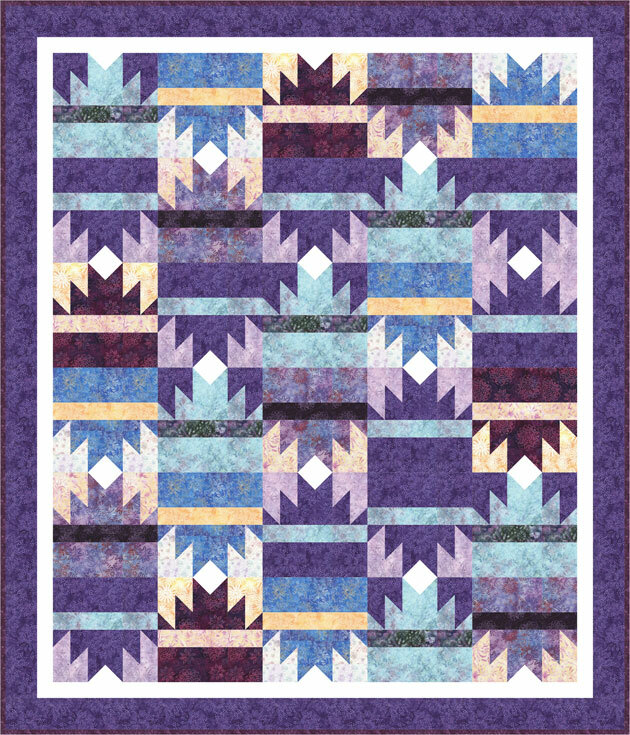 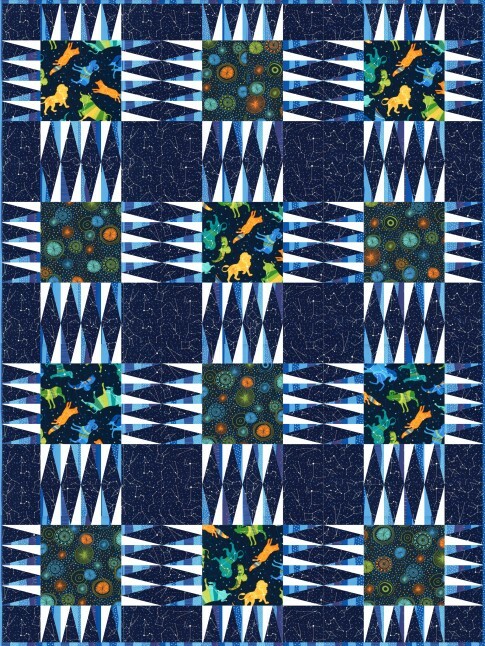 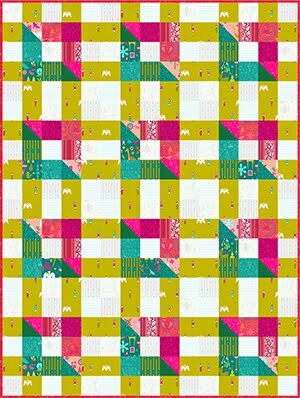 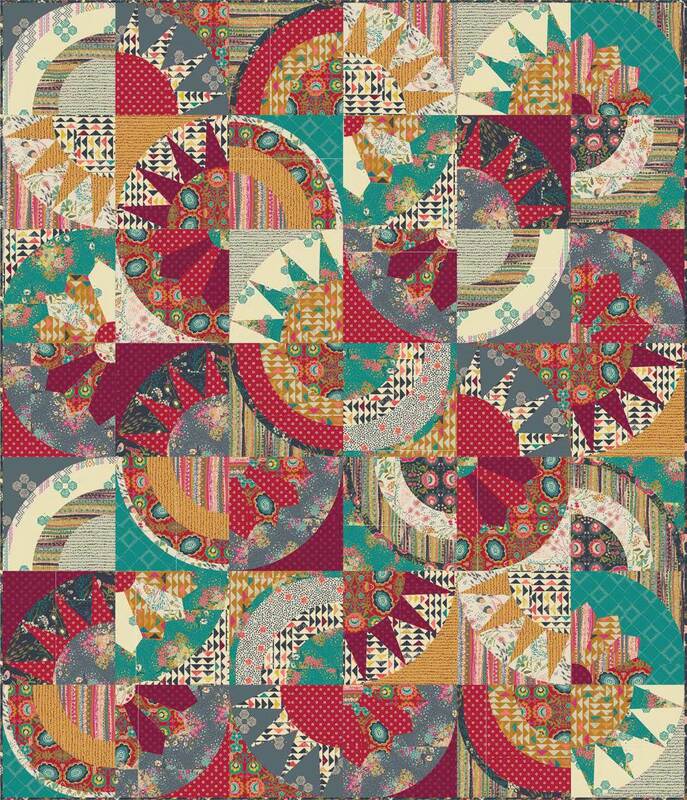 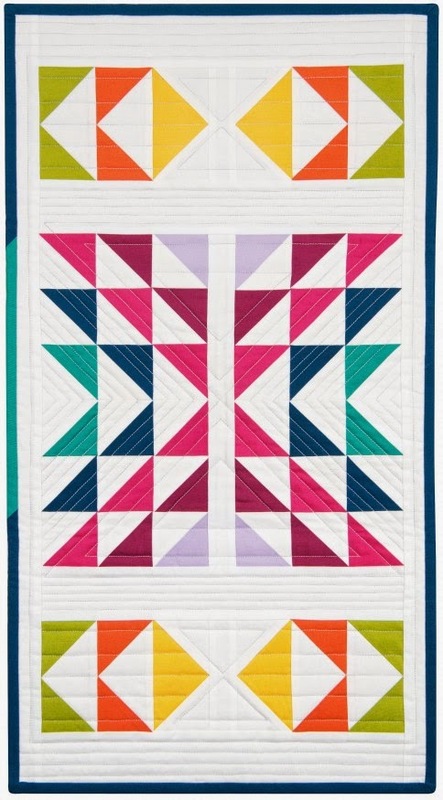 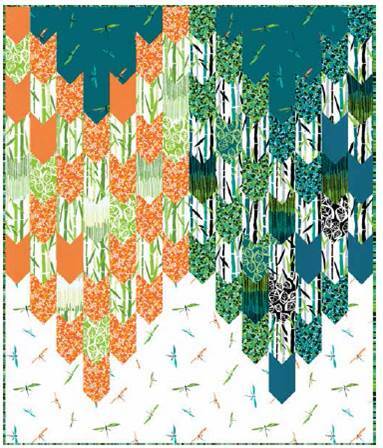 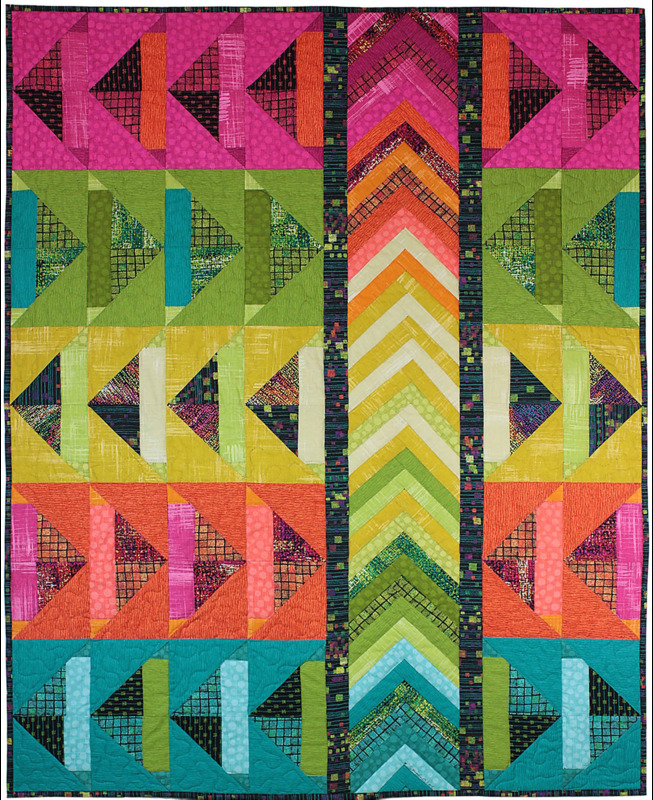 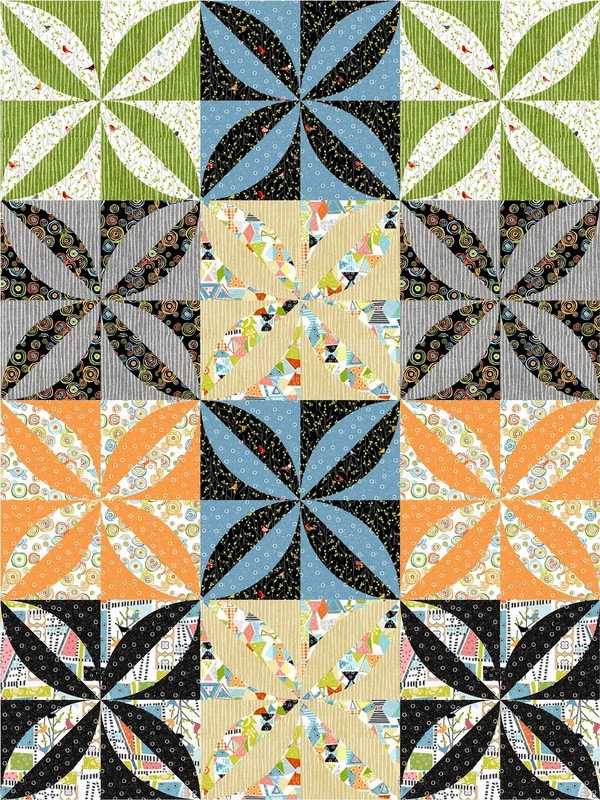 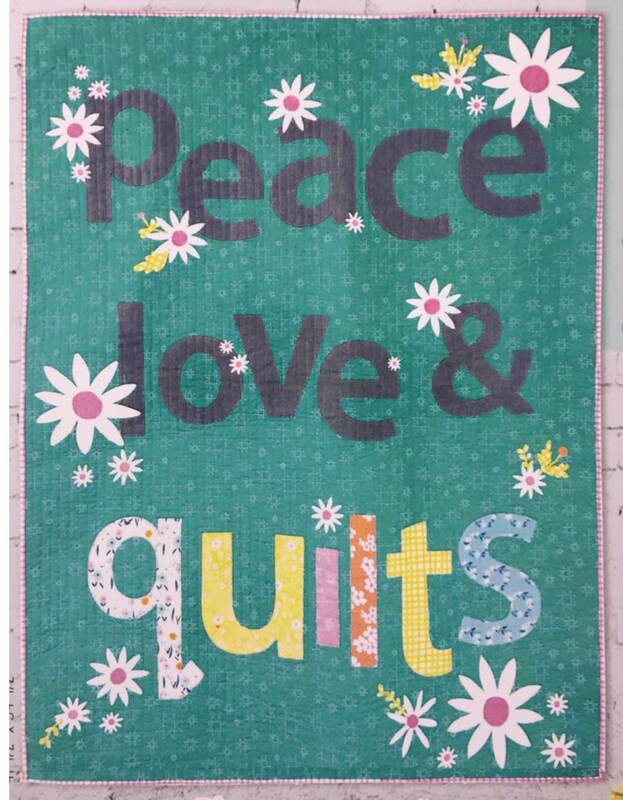 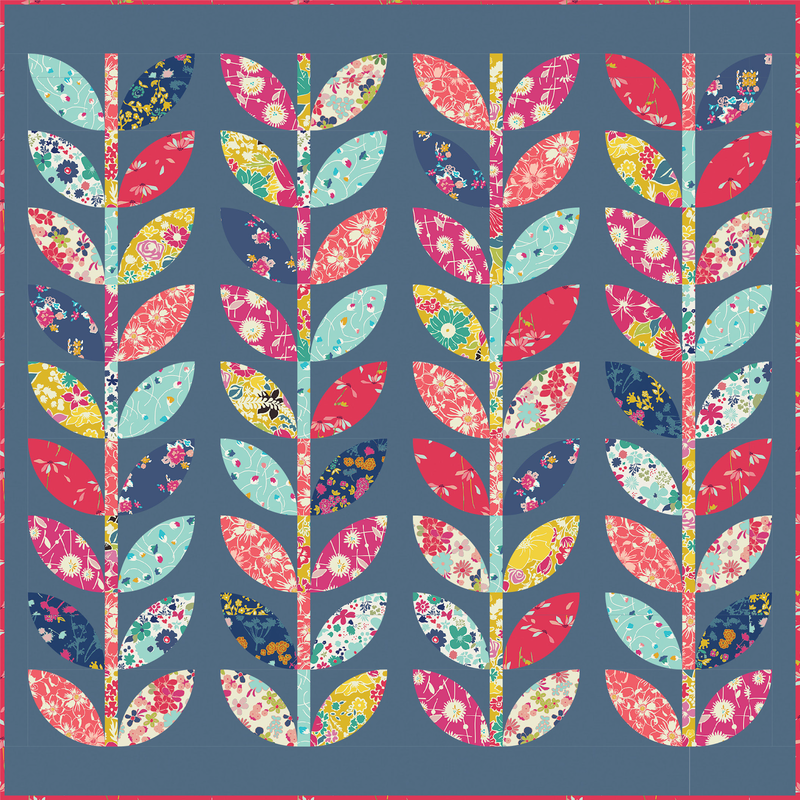 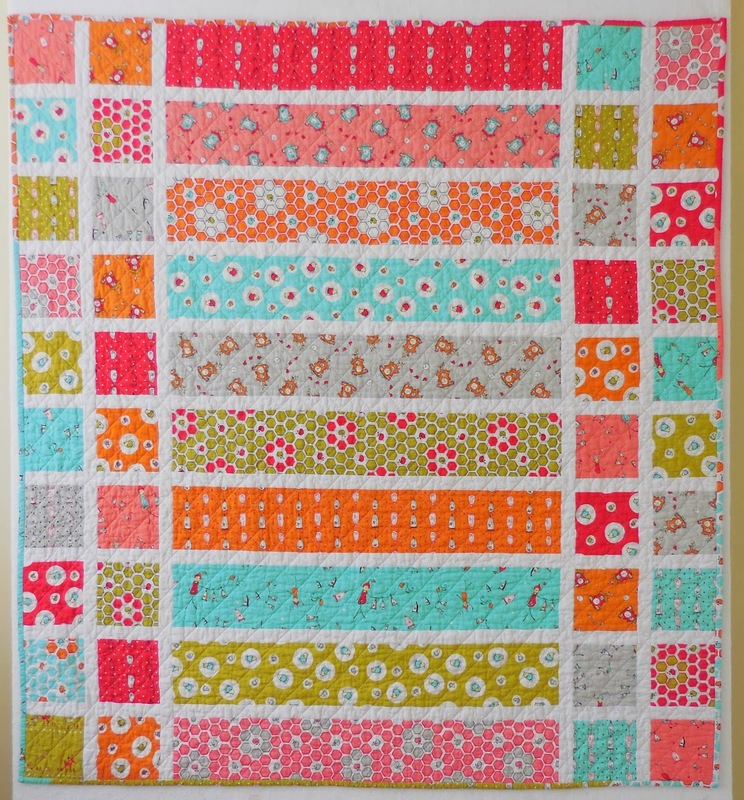 There are so many fun selvages in this quilt! This close up photo shows the way in which the selvages come together to form diamonds, lending the quilt a graphic quality. 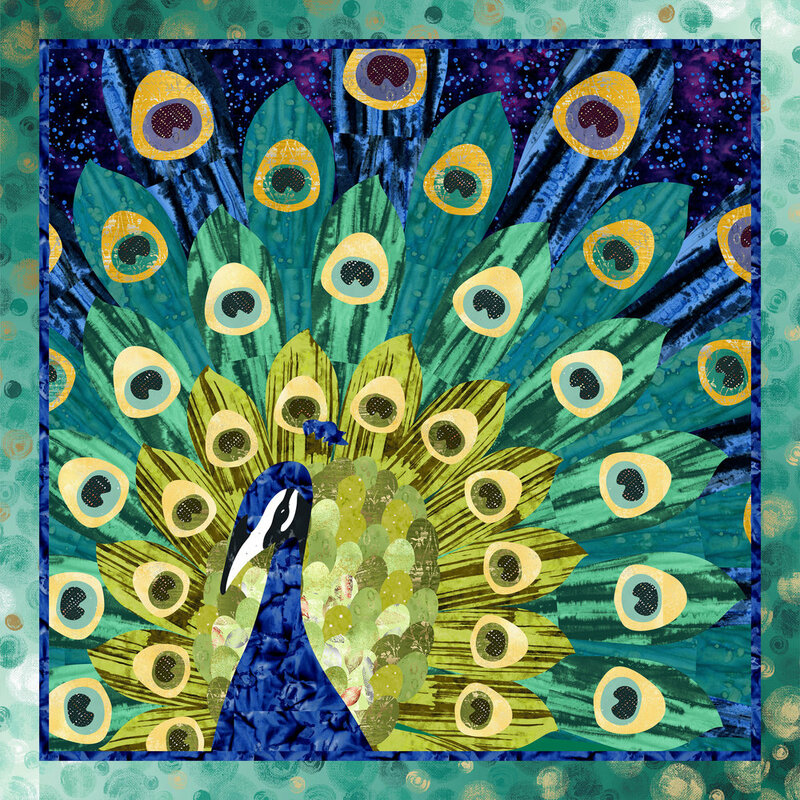 Marla Hattabaugh is a contemporary art quilter whose works have been featured at the Arizona Quilters Hall of Fame and many exhibits and shows. Her intriguing quilt is made with hand processed fabrics (dyed, deconstructed, discharged, etc.) 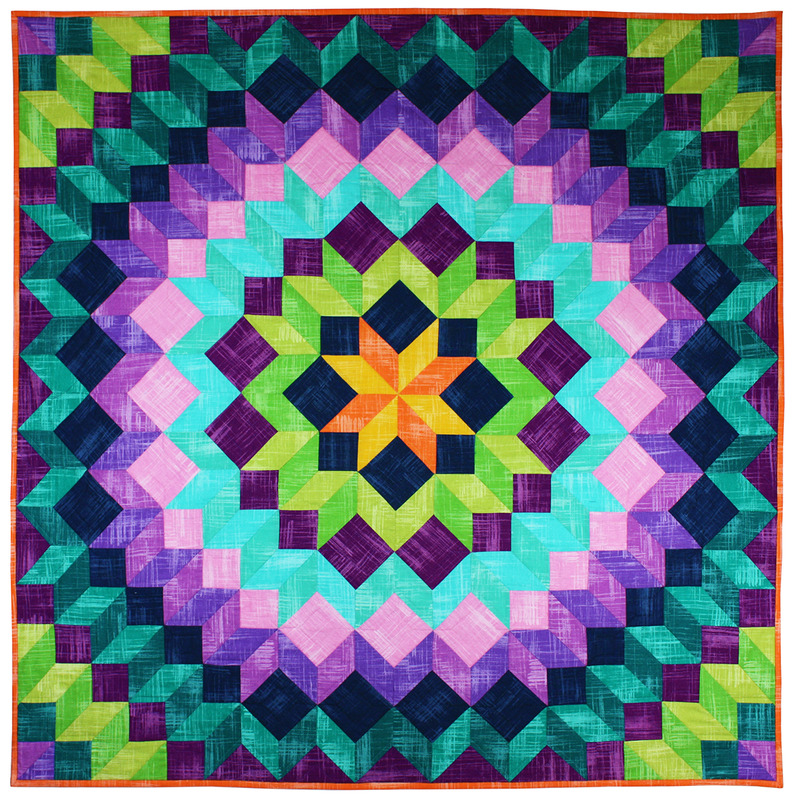 The bold center design, in chartreuse, is surrounded by contrasting red-violet. 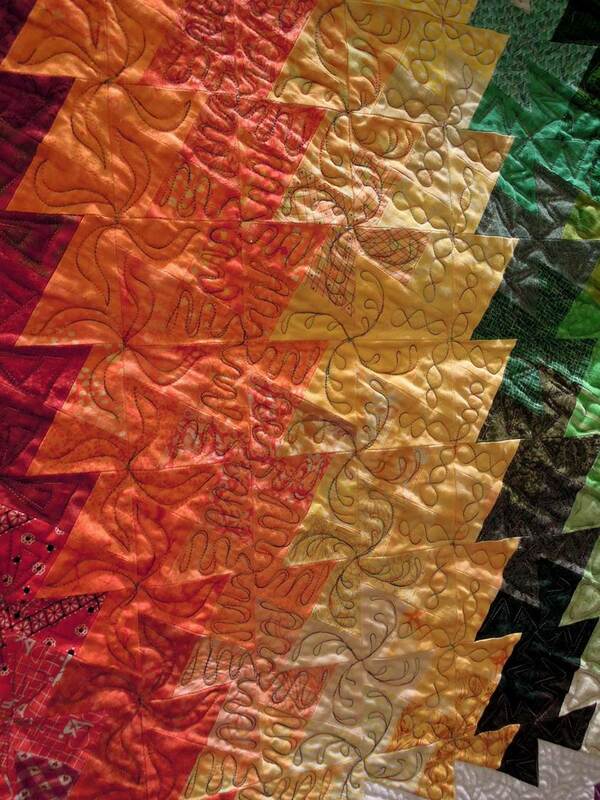 Her free-form quilting can be seen in the close up photo, below. 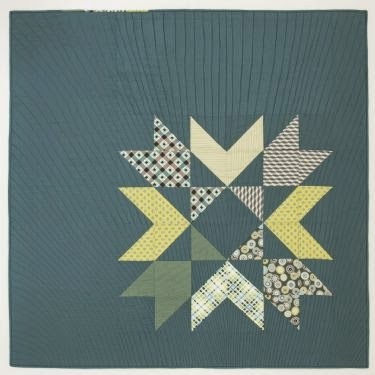 We loved the hand quilting on this contemporary pieced quilt. 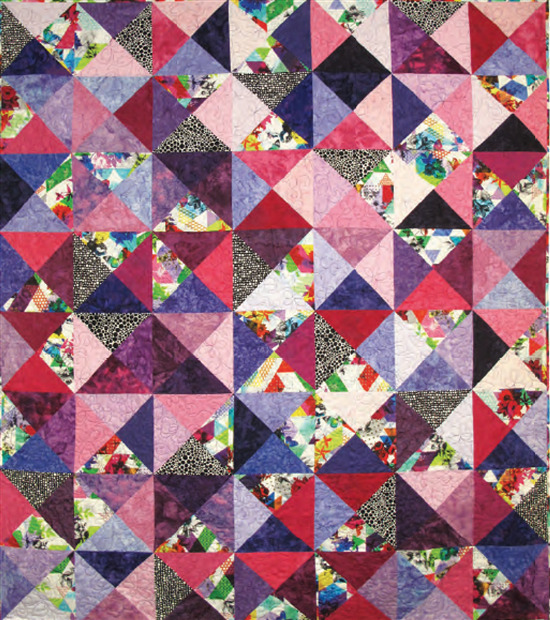 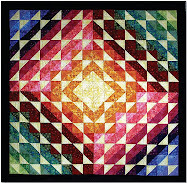 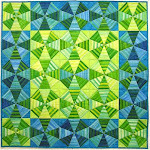 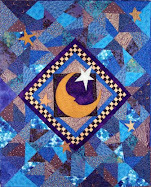 Marla Hattabaugh will be teaching hand quilting at the upcoming Quilt Camp. 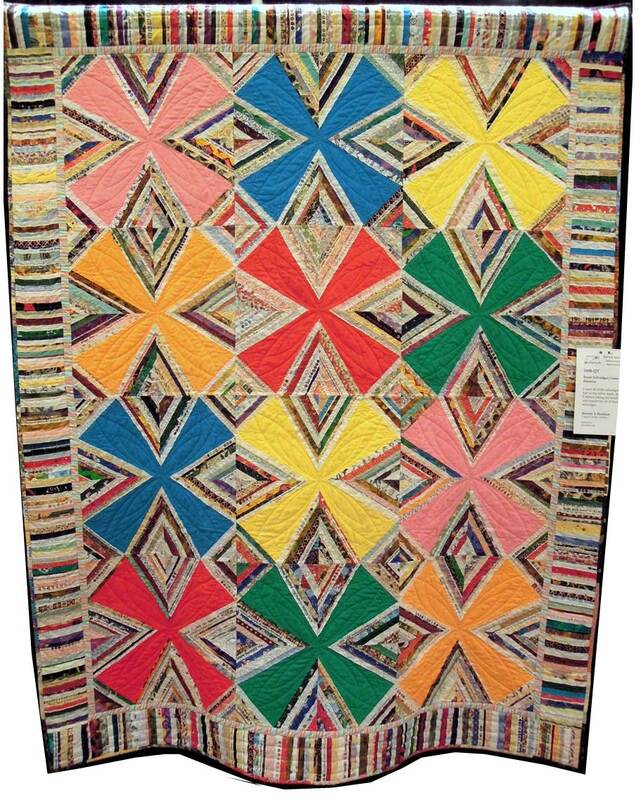 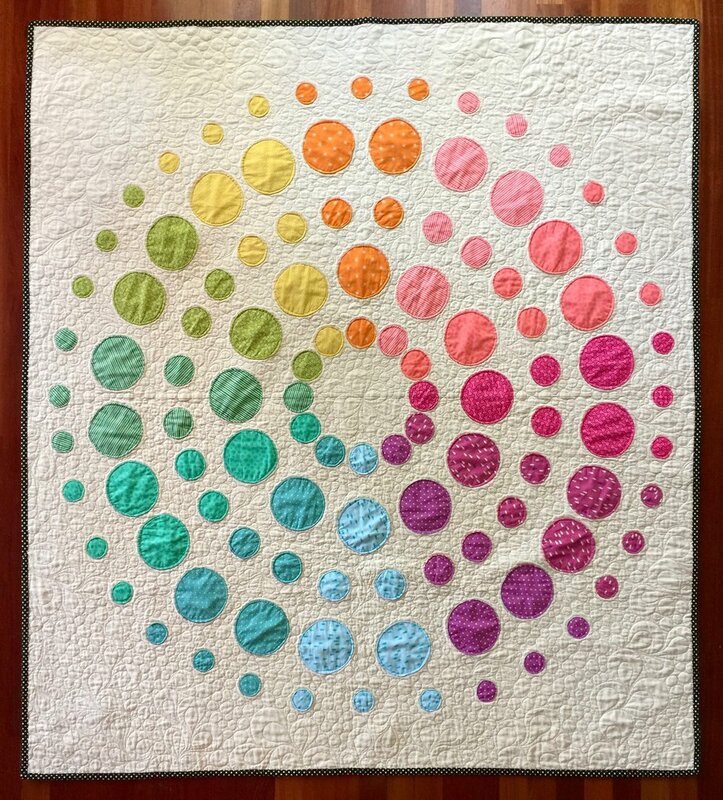 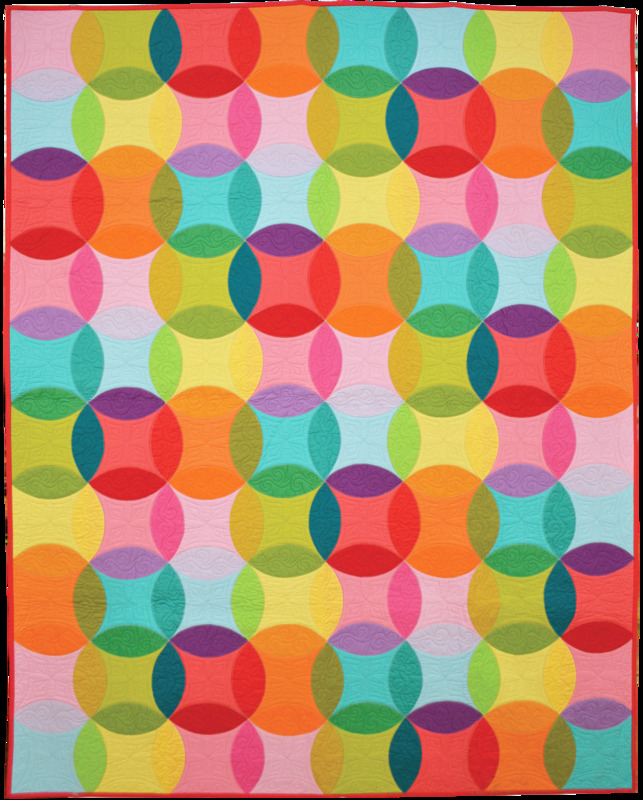 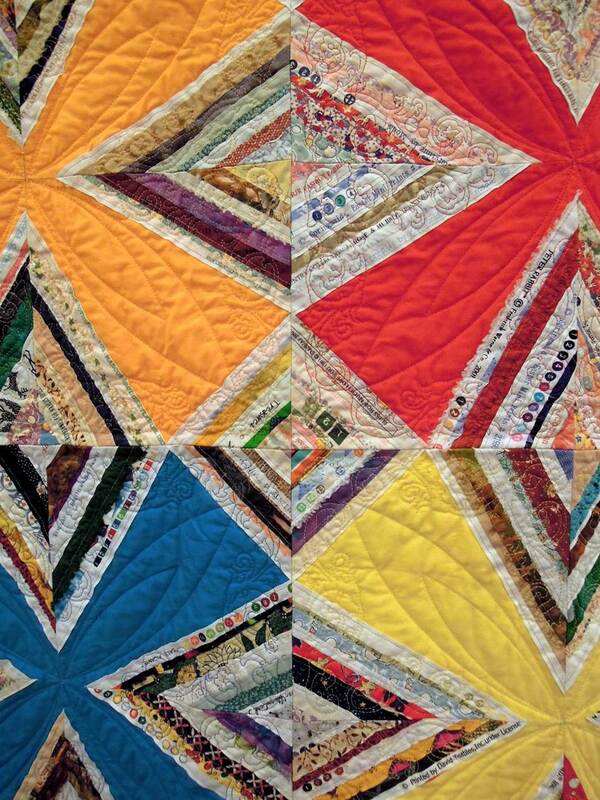 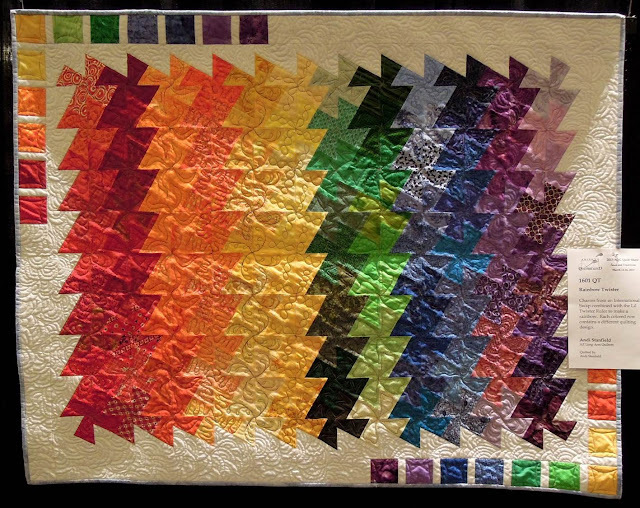 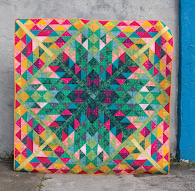 Andi Stanfield used pure colors of the rainbow in this pinwheel quilt. 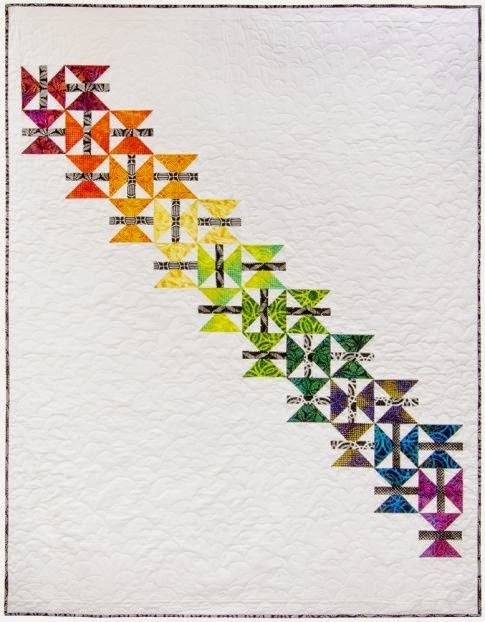 She says: "Charms from an international swap combined with the Lil Twister ruler to make a rainbow." 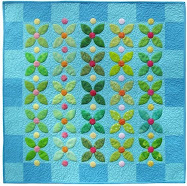 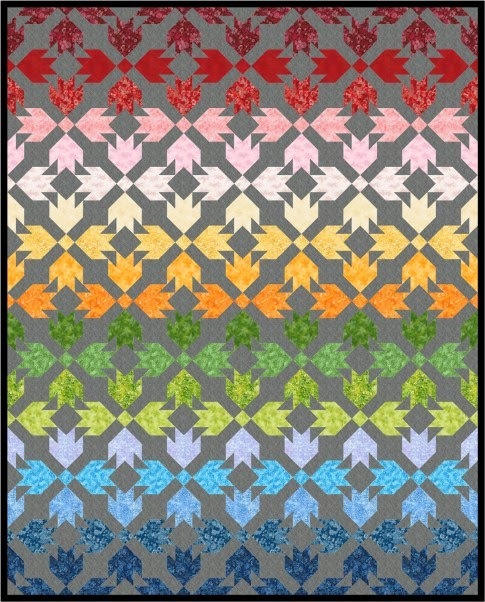 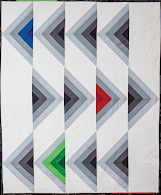 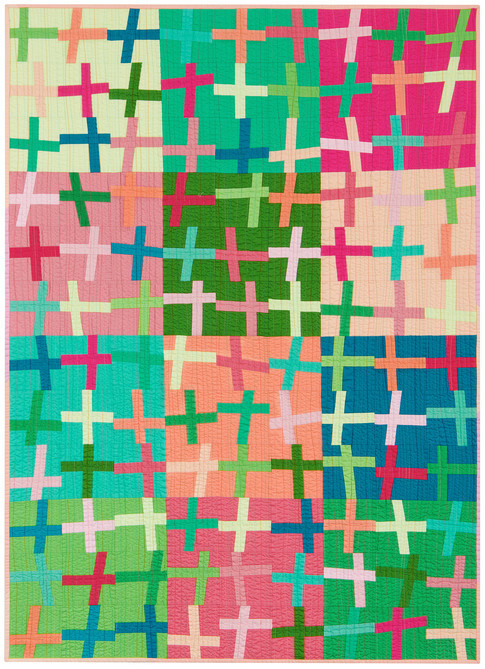 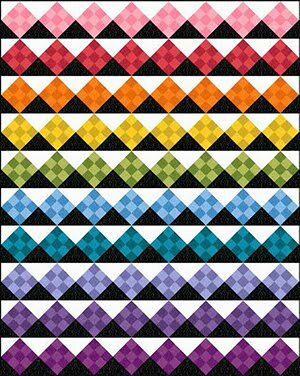 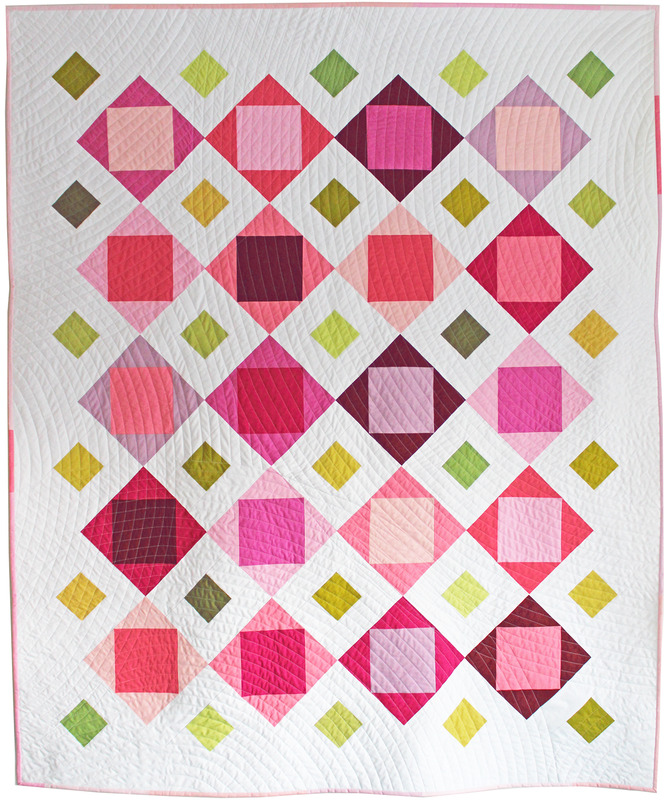 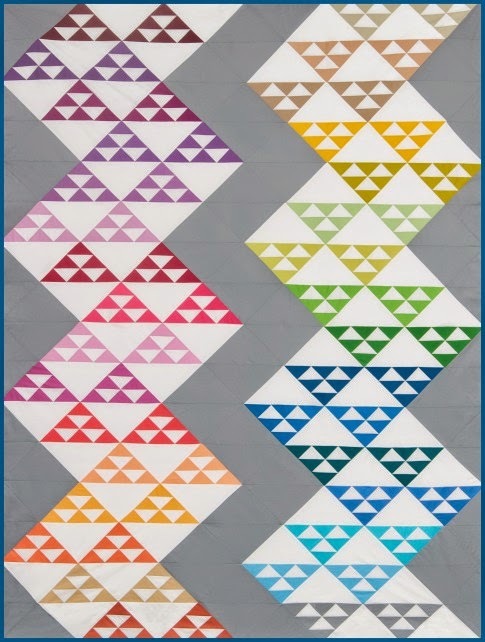 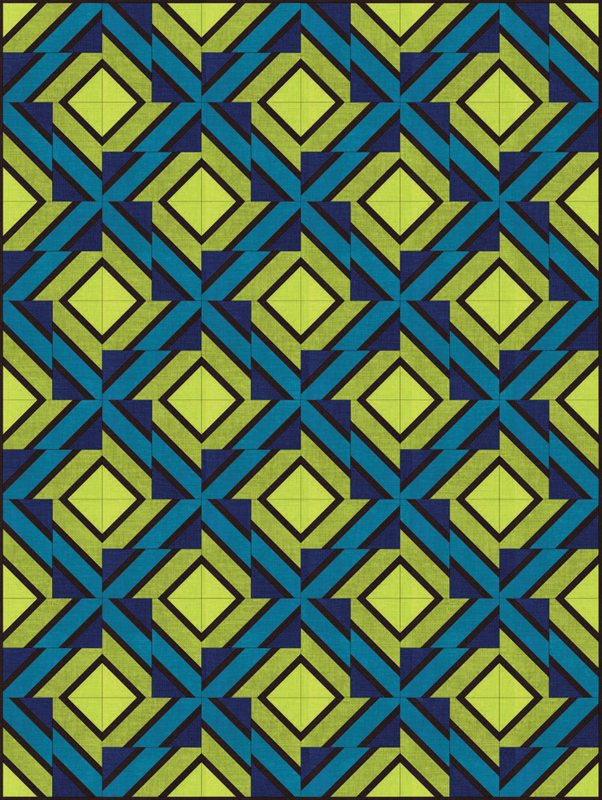 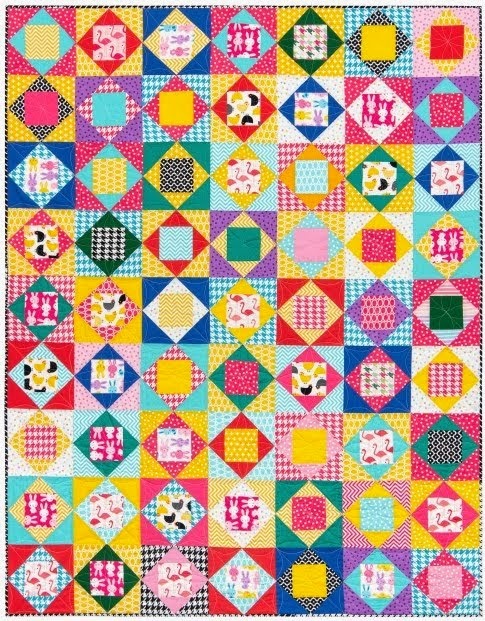 As shown below, each colored row contains a different quilting design. 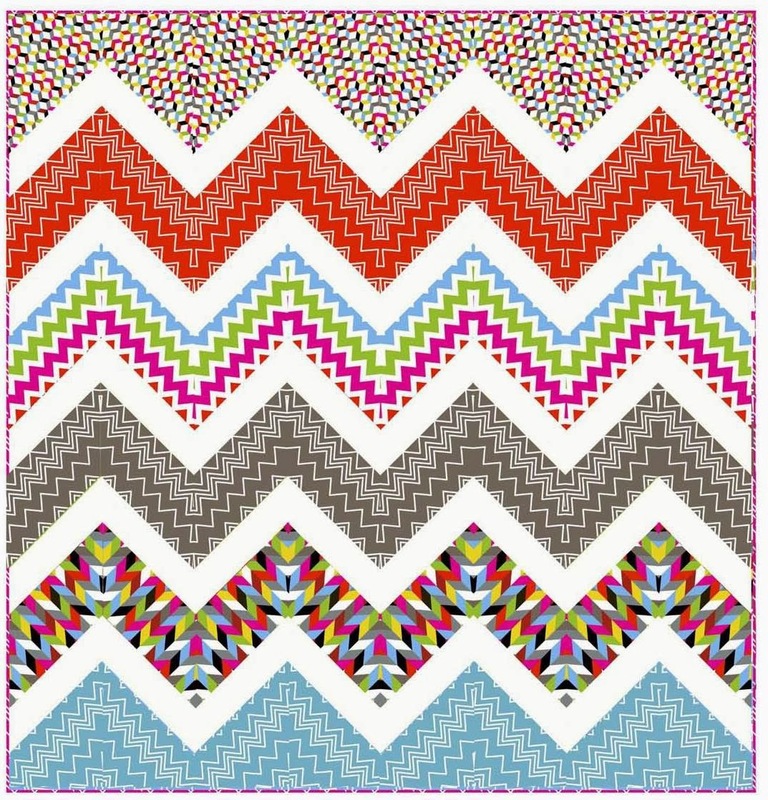 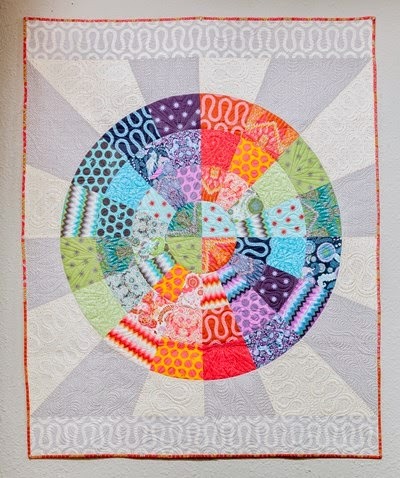 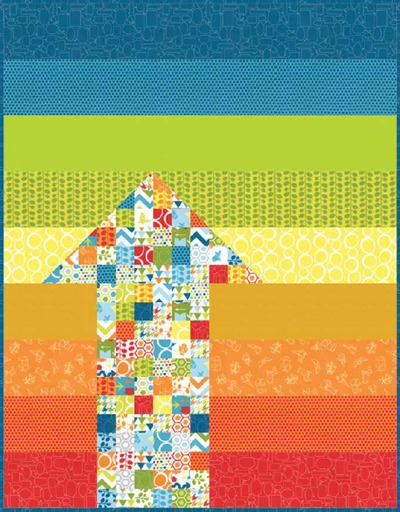 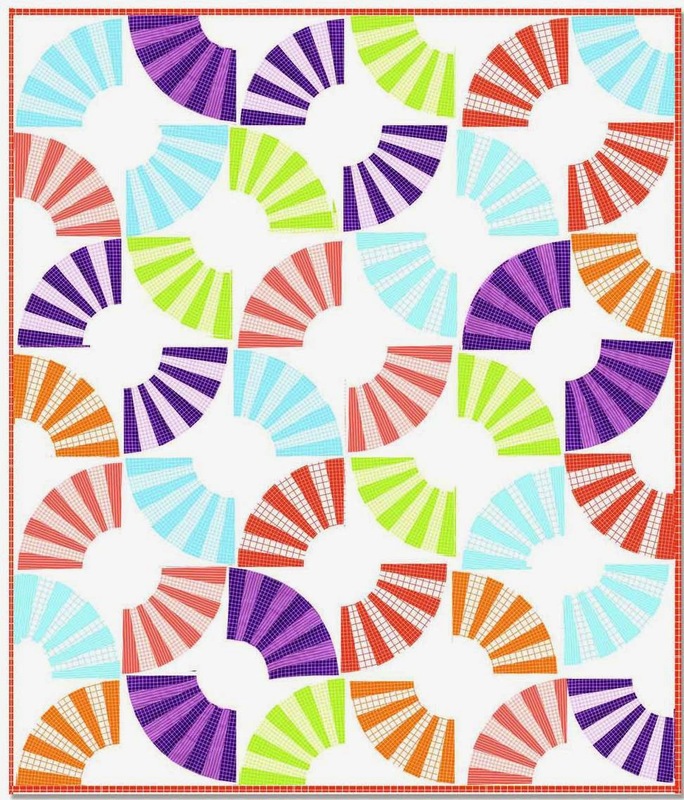 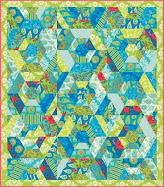 Fun free-motion squiggles, zig zags and swirls added a whole layer of texture to this bright, cheerful quilt. 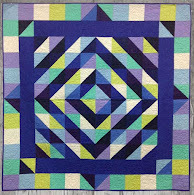 To see how the the Lil' Twister ruler works, check out the tutorial by Jackie at Canton Village Quilt Works.